Thomas Percy Matthews, known as Percy, was born in Blaenavon, Monmouthshire, Wales, in 1886 the son of Superintendent of the Prudential Assurance Company, and later Mayor of Yeovil, Jabez Matthews (1858-1935) and Martha Dixon née Taylor (1857-1936). In the 1891 census Jabez and Martha were living in Park Street, Abergavenny, with their seven children; Emmeline (b1880), Frederick John (b1881), Daniel Albert (b1883), Winifred (b1885), Thomas Percy, listed as Percy, Harold (b1887) and Priscilla (b1890) together with a domestic servant. By 1901 the family had moved to Yeovil and were living at 190 Sherborne Road. By this time the three eldest children had left home but three new children had replaced them; Gladys (b1893), Wilfred (b1895) and Donald (b1897). In the 1911 census 25-year old Percy, listed as Thomas Percy, was a Prudential Insurance Agent like his father but was boarding with the family of tailor James Abbott at 7 Downes Street, Bridport, Dorset. Jabez and Martha were living at 35 The Avenue with their family. 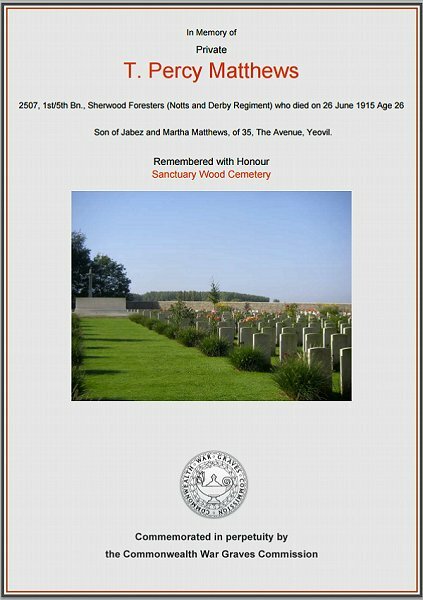 At the outbreak of war in 1914 Percy was back in Yeovil although it is known that he enlisted, with his brother Harold, in the 1st/5th Battalion, Sherwood Foresters at Derby and, from his Service Number 2507, it would seem that he enlisted as soon as war was declared. The 1st/5th (Derbyshire) Battalion was a first-line Territorial Army formation, formed in Derby in August 1914 as part of the 139th (Forester) Infantry Brigade. On mobilisation it moved to Harpenden, Hertfordshire, and in November moved to Braintree, Essex. The Battalion, including Percy, landed in France on 25 February 1915 being part of the first Territorial Division to land in France and the first Territorial units to arrive in a theatre of war when they joined the BEF in the Ypres salient. On 12 May 1915 the Battalion became part of the 139th Brigade in 46th (North Midland) Division and was in action at Ploegsteert, but to those who served here during the Great War it became known as "Plugstreet". The village is at the very south of the area associated with Ypres. Percy was killed by an exploding shell on 26 June 1915, although initially he was reported as missing. He was 26. The Western Gazette in its edition of 9 July 1915 reported "News has been received that Private Percy Matthews, of the Sherwood Foresters (T.F. ), son of Mr and Mrs Matthews, “Llanvair,” The Avenue, is missing and very little hope is held out for his safety. Previous to the outbreak of war he assisted his father in the work of the Prudential Assurance Society in the town and district, and enlisted with his brother, Private Harold Matthews, in the Sherwood Foresters. He has been at the Front with his regiment for the past four months. 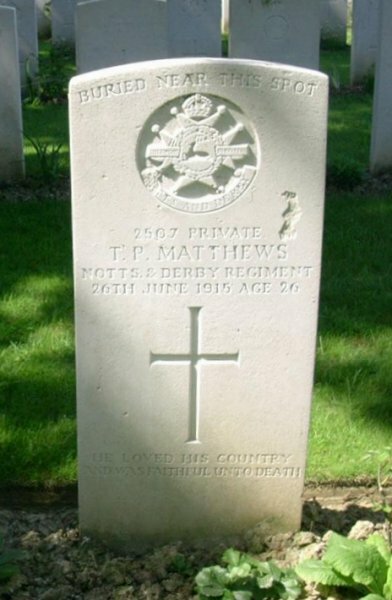 Private P Matthews, who was of a very jovial disposition was a member of the Yeovil Liberal Club." In its edition of 16 July 1915, the Western Gazette reported "Reliable information has now been received that Private Percy Matthews, of one of the Territorial Battalions of the Sherwood Foresters, and one of the sons of Mr J Matthews, of The Avenue, serving with the Army in France, has been killed. It would appear that the Battalion was on trench duty, and that Private Matthews, who was reported last week as “missing,” and some comrades were having tea outside on the reverse of the trench. A shell, which dropped short exploded over the party, killing Private Matthews, and others, and wounding more. He had been at the Front for some months and had taken part on some dangerous enterprises, one of which included work in listening patrols sent out at night in front of enemy trenches. The greatest sympathy has been expressed with Mr. and Mrs. Matthews and family in their loss." Percy was interred at Sanctuary Wood Cemetery, Grave V.C.20, and his name is inscribed on the War Memorial in the Borough. Percy lost two brothers in the war - Arthur Donald Taylor, known as Donald, and Wilfred Vernon. The Memorial Plaque commemorating Thomas Percy Matthews. Also known as Death Plaques, the plaques were made of bronze, and hence popularly known as the "Dead Man’s Penny", because of the similarity in appearance to the somewhat smaller penny coin. Diameter approx. 120mm, rim thickness approx. 4mm, weight approx. 333g. 1,355,000 plaques were issued, which used a total of 450 tons of bronze. They continued to be issued into the 1930s to commemorate people who died as a consequence of the war. 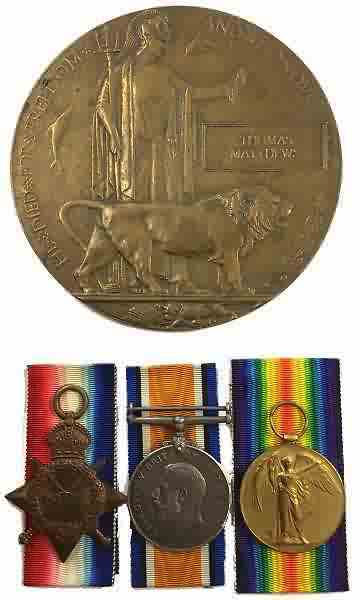 The medals are those awarded to Percy - Pip, Squeak and Wilfred are the affectionate names given to the three Great War campaign medals - the 1914-15 Star, British War Medal and Victory Medal respectively. These medals were primarily awarded to the Old Contemptibles (British Expeditionary Force) and by convention all three medals were worn together and in the same order from left to right when viewed from the front. The Commonwealth War Graves Commission certificate in memory of Thomas Percy Matthews.